I have a confession to make. I have never seen a movie or television adaptation of Leo Tolstoy’s 1869 novel, “War and Peace”. Never. Well . . . I once made an attempt to watch the 1956 movie adaptation directed by King Vidor. Unfortunately, I could never go the distance. In fact, I have never read the novel. However, many years passed. When I heard about the BBC’s latest adaptation of Tolstoy’s novel, my curiosity got the best of me and I decided to give “WAR AND PEACE” a chance. The six-part miniseries is simply about the experiences of five Russian families during the Napoleonic Wars in the early 19th century. Those families include the Bezukhovs, the Bolkonskys, the Rostovs, the Kuragins, and theDrubetskoys. The miniseries seemed to be divided into three segments during a period between 1805 and 1812-13. The first segment featured the introduction of the main characters and Russia’s preparation of a war against Napoleon’s France. This culminates into the Battle of Austerlitz in which two major characters – Prince Andrei Nikolayevich Bolkonsky and Count Nikolai Ilyich Rostov – participate. The second segment featured the characters’ personal experiences at home. During this period, the miniseries explored Count Pyotr “Pierre” Kirillovich Bezukhov’s failed marriage with the beautiful, but vapid and unfaithful Princess Yelena “Hélène” Vasilyevna Kuragina; the Rostov family’s financial woes and how it affected Nikolai Rostov; the emotional strains within the Bolkonsky family; Prince Boris Drubetskoy’s efforts to advance his military career; and especially Countess Natalya “Natasha” Ilyinichna Rostova’s love life, which included both Andrei Bolkonsky and Prince Anatole Vasilyevich Kuragin. This segment also included news of Treaties of Tilsit of 1807, which ended hostilities between Imperial France and Imperial Russia and Prussia. The miniseries’ final segment focused on France’s invasion of Russia in 1812 and the characters’ efforts to survive it. I could compare director Tom Harper and screenwriter Andrew Davies’ adaptation with Tolstoy’s novel, but it would be a useless effort. As I had earlier pointed out, I have never read the novel. But I do have at least two complaints about the productions. One of them revolved around the relationship between Natasha Rostova and Andrei Bolkonsky. I realize that the publicity machine on both sides of the Atlantic had undergone a great effort to build up the relationship between the pair. Frankly, I found the publicity campaign rather wasted. The Natasha/Andrei romance struck me as a disappointing and wasted effort. The majority of their story arc – which began with their meeting at a ball near the end of Episode Three, continued with Natasha’s brief romance with the slimy Anatole Kuragin, and ended with Natasha’s romances with both men crashing around her by the end of Episode Four; had moved . . . so damn fast that it left my head spinning. I cannot help but wonder if the entire arc could have been portrayed with more detail if the series had stretched a bit longer. WHAT IN THE HELL??? Their costumes looked more appropriate for present-day evening wear than the early 19th century. What was Mr. Gibbons thinking? Despite the rushed Natasha Rostova/Andrei Bolkonsky romance and despite the rather questionable costumes, I managed to enjoy “WAR AND PEACE” very much. I am a sucker for family sagas, especially when they are seeped in a historical background. And “WAR AND PEACE” nearly pushed every one of my buttons when it comes to a well made saga. It had everything – romance, family struggles, historical events and personages. When I realized that Tolstoy had originally focused his tale on five families, I did not think Andrew Davies would be able to translate the author’s novel in a tight story without losing its epic quality. There were certain sequences that really blew my mind, thanks to Davies’ writing and especially, Tom Harper’s direction. I thought Harper did an outstanding job of re-creating battles like Austerlitz and Borodino, along with the French Army’s retreat from Moscow. Harper also did a great job in directing large parties and ball scenes. My two favorites are the party held at St. Petersburg socialite Anna Pavlovna Scherer’s salon in Episode 1 and the ball where Natasha and Andrei met in Episode 3. But it was not just the battle and crowd scenes that impressed me. “WAR AND PEACE” is – after all – a melodrama, even if many literary critics are inclined not to admit it. I never thought I would find myself getting caught up in the lives of the saga’s main characters. But I did. I must admit that I admire how Tolstoy . . . and Davies managed to allow the three main characters – Pierre, Natasha and Andrei – to interact with the five families, regardless of blood connection or marriage. I especially enjoyed the explorations into the lives of Pierre, the Rostovs and the Bolkonskys. At first glance, some might regard the miniseries’ ending that featured a picnic with the families of the three leads as a bit on the saccharine. It did have a “happily ever after” tinge about it. But I read in a newspaper article that complained about Tolstoy’s “realistic” ending – one that featured a less-than-happy view of the protagonists’ lives and a critique from Tolstoy on all forms of mainstream history. Thanks to Davies’ screenplay, audiences were spared of this. “WAR AND PEACE” featured a good number of first-rate performances from a supporting cast that included Stephen Rea, Gillian Anderson, Tuppence Middleton, Callum Turner, Mathieu Kassovitz, Jessie Buckley, Adrian Edmondson, Aisling Loftus, Rebecca Front and Aneurin Barnard. However, I was especially impressed by certain supporting performances. One came from Greta Scacchi, who portrayed the Rostov family’s practical and sometimes ruthless matriarch Countess Natalya Rostova. I also enjoyed Brian Cox’s portrayal of the world weary General Mikhail Kutuzov, who has to contend with not only Napolean’s army, but also the amateurish interference of the Czar. Tom Burke did a great job in portraying the wolfish and ambitious army officer, Fedor Dolokhov, who eventually becomes a better man following Napoleon’s invasion. Jack Lowden’s portrayal of the young Count Nikolai Rostov really impressed me, especially when his character found himself torn between following his heart and marrying a wealthy woman to restore his family’s fortunes. And Jim Broadbent gave a very colorful performance as Prince Nikolai Bolkonsky, the mercurial and controlling patriarch of the Bolkonsky family. And what about the production’s three leads? Lily James gave a very charming performance as Countess Natasha Rostova. Well . . . I take that back. Describing James’ performance as simply “charming” seemed to hint that I found it rather shallow. Yes, James handled Natasha’s “light” moments with her usual competence. More importantly, she did an excellent job in conveying Natasha’s personal struggles – especially during the series’ second half. There were times when I did not know what to make of the Prince Andrei Bolkonsky. He struck me as a very unusual protagonist. Although I found him rather honorable and filled with valor, Andrei did not always struck me as likable – especially in his relationship with adoring, yet ignored wife Lise. And Norton superbly captured the many nuances of Andrei’s character. 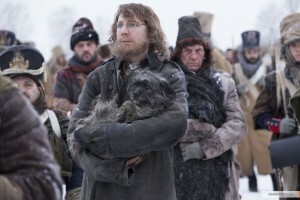 If Andrei Bolkonsky struck me as an unusual protagonist, Count Pierre Bezukhov struck me as one of a kind. Well . . . one of a kind for a literary piece written in the 19th century. Sometimes, I get the feeling that someone like Pierre could easily translate into a late 20th century or early 21st century geek. Or perhaps not. I think Pierre is too kind and open-minded to be considered a geek. But he is very unusual for a leading man. And thanks to Paul Dano’s superb portrayal, Pierre has become one of my favorite fictional characters. He did a stupendous job in conveying Pierre’s character from this insecure and rather naive man to a man who learned to find wisdom and inner peace through his struggles. Dano was so good that I had assumed that his performance would garner him a major acting nomination. It did not and I am still flabbergasted by this travesty. My taste in period dramas usually focused on stories set in the United States or Great Britain . . . with the occasional foray into France. I was very reluctant to tackle this latest adaptation of Leo Tolstoy’s most famous novel. But I was in the mood for something new and decided to watch the six-part miniseries. I am happy to say that despite some flaws, I ended up enjoying “WAR AND PEACE” very much, thanks to Andrew Davies’ screenplay, Tom Harper’s direction and an excellent cast led by Paul Dano, James Norton and Lily James.